How do you view God in a desert? There’s two types of birds. There’s vultures, and there’s hummingbirds. One lives off dead carcasses, rotting meat. The other lives off the beautiful, sweet, nectar in a particular flower, on a particular desert plant, in the same desert. They both find what they’re looking for. Do you know—take it all the way back into the Old Testament—and the Muslim and you, we actually serve the same God. Allah, to a Muslim; to us, Abba Father, God. It would seem pretty clear above that Houston has just told us those who adhere to the world religion of Islam, the followers of the prophet Muhammad, are serving the same God as those of us who are regenerated believers in the one true and living God of the Bible, the followers of Christ Jesus, the Lord. But later on Brian Houston, who is Senior Pastor of the nefarious Word Faith haven Hillsong Church (HC) Australia along with his wife pastrix Bobbie,1 could be seen going around the Internet proclaiming: Wait a minute, that’s not really quite what I meant. Being one of those “critics” I wanted to make sure that in the interest of fairness you’d have the chance to see this for yourselves. I also wish to point out a couple of things here, speaking simply for myself as I have no way of knowing the intentions of whatever other critics Brian Houston is talking about; whomever they may be. [T]ake it all the way back into the Old Testament—and the Muslim and you, we actually serve the same God. Allah, to a Muslim; to us, Abba Father, God. Notice that Houston says you—to the Christians he’s addressing—then appears to include himself with them as he says “we actually serve,” etc. ” Now we know that Christians holding the view that Islam is an Abrahamic faith usually also believe the Muslim has wrong beliefs about the one God. The problem really isn’t with someone like myself who is trying to understand what is being said by attributing the meanings to words I find in dictionaries and text books. No, the problem stems from Christians who use what seems to me to be purposely vague language when it comes to the false religion of Islam. If you listened to the message in its entirety, my point was that; who a Muslim extremist believes God is, determines what they believe God does, and what they believe God loves. I was contrasting their harsh perspective of (their) god, with who I believe God is – (a Loving God, the Father of our Lord and Saviour, Jesus Christ) and therefore what I believe God does and what I believe God loves. The ONE sentence that critics are drawing huge conclusions from was clearly a (clumsy) way of me explaining that though both Christians and Muslims believe they serve the God of Abraham, they are very DIFFERENT ‘entities’ or ‘deities’ in both nature and action. The botheration begins when Houston’s words in his original message are combined with his later Twitter statement, “Islam descends from one of Abraham’s sons.” They could easily seem to indicate that, in spite of their differing views about God, he meant Muslims and Christians do serve the same One. 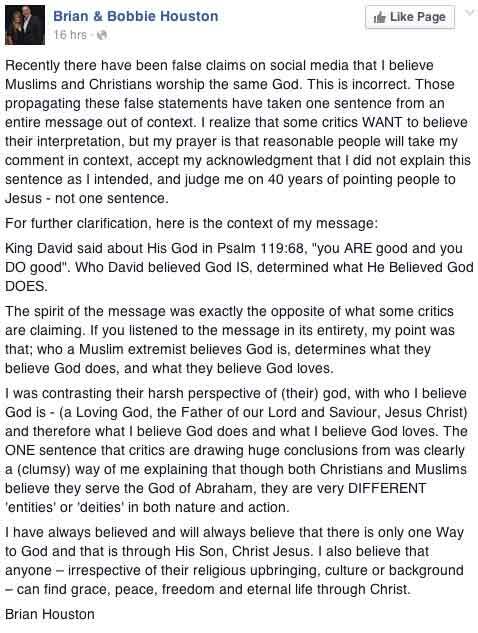 As I get ready to close this out, I offer that if Brian Houston wishes to address such important and sensitive subjects as the nature of God and the religion of Islam then he needs to learn to be more precise in his language. That said, Islam cannot be an Abrahamic faith because it doesn’t believe in the God Abraham believed in. Now, since the Qur’an was supposedly brought by that being, who allegedly appeared to Muhammad, contradicts the Bible on the nature of God, then we know that this being could not have been an angel sent by the LORD God Almighty. If anything appeared at all, then it would have a lying, deceitful, spirit i.e. a demon. As I told you in Keeping You Apprised of: Islam, while Islam does teach the existence of just one God (Qur’an 5:73; 112:1-4), Allah is so transcendent, incomprehensible and unapproachable, that it could not possibly be the one true and living personal God of biblical revelation, Who shows Himself to befriend men (Exodus 33:11). The God of Holy Scripture is shown to be merciful to them because He loves them (Romans 5:5-8), and, in the doctrine of the Trinity, He reveals Himself as God the Father, God the Son–Jesus the Christ, and God the Holy Spirit (Deuteronomy 6:4; 2 Peter 1:17; John 1:1,14; Acts 5:3-4; 2 Corinthians 13:14). They do blaspheme who say: God is one in three in a Trinity: for there is no god except one. Finally, the Qur’an portrays a different Jesus from the One we meet in the Bible. It says Jesus was not crucified (4:157), is not Deity (5:17, 75), nor is He even the God the Son (9:30). So, in the end, Islam is not an Abrahamic faith because Allah, the god of Islam, is nothing at all like the Biblical revelation of the only God there is.